By doubling the genetic material in an oil plant, Kaiima says it can make biodiesel more economical. It can also get around GMO regulations. Arguably, it's a GMO without GMOs. Kaiima, based in Israel, says it has devised a technique for multiplying the number of chromosomes in biofuel and other agricultural crops in a way that will increase harvests while at the same time skirting some of the technical and regulatory risks surrounding genetically modified organisms. 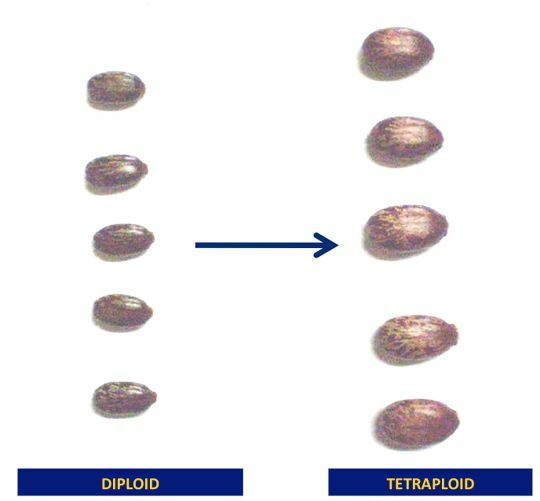 The company already sells seeds for castor plants with four sets of identical chromosomes that can produce about 4 to 7 tons of feedstock per acre, or more than double the 1.5 tons associated with naturally occurring castor. The oil can be used for biofuel or bioplastics. These higher-growth plants require more water and absorb more nutrients from the soil than conventional versions of the same plant, but that gets counterbalanced by higher yields, Gal added. In the end, farmers get more oil or food out of a fixed base of resources. The science behind the company revolves around polyploidy, a condition in which a species has more than one set of chromosomes. Durum wheat, for instance, has four sets of chromosomes (making it a tetraploid) while wheat grown for bread flour has six sets of chromosomes. Polyploids can occur naturally and then spread through selective breeding. Those freakishly large strawberries you see in grocery stores these days? Polyploid varieties. Although polyploid plants can reproduce and survive for generations, polyploidy typically does not work well in humans or animals. Doubling of a chromosome in humans, for example, leads to Down Syndrome. Some biologists believe that in plants polyploidy acts as a survival mechanism, allowing plants to endure droughts and other hazards. The percentage of polyploidy plants is greater in harsh environments, Gal noted. "Animals can move. Plants can't. It is a way to become more robust," he said. Various scientists have developed polyploid plants in the lab, but the effort often fails. Many of the resulting plants can't reproduce, have had their genome damaged during the polyploidy process, or revert back to their more natural genetic state in a generation or two. The problem in part has to do with the tools employed. Polyploidy occurs in the first stage of mitosis, where a cell splits into two. In a normal cell, the DNA in the cell is replicated and then spindle fibers pull the cell into two different directions until two identical, independent cells emerge. The cell multiplication process then continues until you have a full-fledged organism. To recreate the polyploid process in a lab, scientists have bathed the cell in colchicine, a harsh chemical solvent. By contrast, Kaiima does not bathe its cells. It targets its solvent (which he says is gentler than colchicines) directly at the spindle fibers so that less is required. After trial and error, it manages to produce seeds that can give rise to stable crops that do not revert back to single chromosome sets. Injecting solvents in a targeted manner derives from cancer research. Amit Avidov, a well-known seed scientist, is one of the co-founders. Avidov started AB seeds, now part of Monsanto. So why does Gal argue that these plants aren't GMOs? Most genetically modified plants are transgenic, i.e., the genome of the plant contains genes from other species. Kaiima's polyploids do not contain any material from other species. In fact, the strands of DNA are identical to normal plants: there just happen to be more of them. Regulators in some instances don't classify polyploids as GMOs, he said. Look at the polyploid varieties of wheat: although developed centuries ago, humans had a direct impact on the genetic content. Where do you draw the line? Nonetheless, activists have also focused on polyploids. More extensive use of the technique could lead to regulator issues. The company has received $8 million in backing so far from DFJ Tamir Fishman, the Israeli firm associated with Draper Fisher Jurvetson, and Musea Ventures. Kaiima, by the way, means sustainability in Hebrew.